Have you ever made a delicious roast beef only to realize you’re stuck with the (only relatively appetizing) leftovers for days to come? Now you can make a roast with a game plan in mind. With this meal, all you’re doing is making a thick sauce to go over your meat and breathe new life into it, so it’s not time consuming and it complements the meat wonderfully. We hate the feeling of being stuck with a dish without a way to make it new and interesting again, but this Beef Miroton dish does just the trick and gives us an entirely new and delicious meal! In a large pan over medium heat, melt two tablespoons of your butter and saute onions until softened and translucent. Stir in flour until you have a thick, paste-like sauce. Pour in beef gravy, broth and red wine vinegar. Mix until smooth. Taste and add salt and pepper as needed. Place a little of sauce on the bottom of baking dish and layer leftover meat on top. Then pour the rest of sauce and onions over the top. Evenly spread breadcrumbs over the top and drizzle with leftover butter. 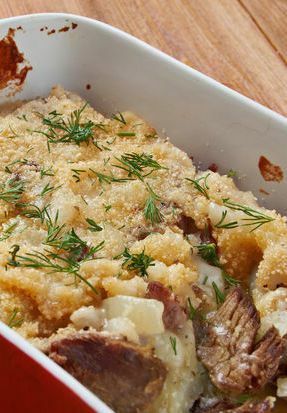 Place in oven and bake for 5-10 minutes, or until warmed through and the breadcrumbs are golden and crispy. Remove, garnish with parsley or rosemary and let cool for 10-15 minutes. Serve warm.